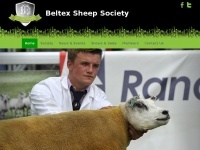 Beltex is primarily a Terminal Sire to cross with British Sheep and half-bred continental sheep. The main characteristics being double muscled hindquarters coupled with fine bones. Keywords: Beltex Sheep Terminal Sire Double Muscled British Continental Export Market Finished Lamb Eye Muscle Killing out Percentage.